Thinking as an income investor, would you be happy if ninety percent of your stocks increased their dividend since you bought them? I have the luxury of being able to go through the stock picks I published over the past 8 years and report on their dividend growth. The rule of 90 and 10 is similar to the my rule of threes. I started publishing my annual portfolios after I retired from managing other people's money. These portfolios are buy and hold only portfolios. If a stock is bought out, we took the money. If there was a merger, that is reflected as are spin offs. Cash from buyouts is held in the portfolio as cash. One could think of it as an emergency fund. Retirees who bought these stocks in a qualified retirement plan, could use this cash as a cushion or to fund part of the required minimum distribution. The savvy investor will buy short term rolling certificates of deposit. 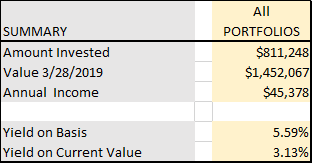 The table below presents the dividend increase data from my 2011 - 2018 portfolios. Note that in 2016 I published only a covered call portfolio which I sold in February 2017; that portfolio is not included in this analysis. 2014 was the worst portfolio, on every level. Not only did 4 of 18 stocks reduce their dividend, 2014 stocks have not appreciated as much as the other portfolios. When you look at all seven portfolios, you can see in 5 of the 7 years, less than 10% of stocks picked reduced their dividend. If you consider all the stocks which number nearly 100 names, you will see only 9 have reduced the dividend, pretty close to 90 and 10. One stock, Conoco Phillips, symbol COP, affected four portfolios. In COP's defense, in the 2011 and 2012 portfolios investors received 50 shares of Phillips 66, symbol PSX, when combined the dividend stayed about the same until COP made a huge dividend cut in 2016. Since then, the dividend increases have resumed but are not yet back up to the pre split amount. The PSX spin off has been very good with dividend increases averaging 23% per year. MHLD, Maiden Holdings, is a re-insurer that got pummeled with the natural disasters of recent years and with their alliance with another insurer with questionable fundamentals. MHLD reduced the dividend in September, 2018 and have since suspended the dividend. Moreover, I fear that MHLD will be the first stock of these portfolios to go "belly up." WPZ, Williams Partners, was a master limited partnership bought by its master. Holders of WPZ stock received 1.494 shares of WMB for each share of WPZ. Fractional shares were paid in cash. Even with that increase in shares the dividend reduction is about 33%. PBI, a stock with a good history when it was purchased just could not keep up with modern technology. A bad pick on my part which shows you might want to use more than just my minimal criteria when picking a stock. JCS is a very small ethernet and communications equipment company with no debt but declining and revenues and negative earnings per share, ARLP, a coal provider split the stock early but could not keep up with the pressure of reducing coal production. Then there is SJR, a communications company who pays their dividend every month rather than quarterly, but the dividend is down slightly recently. DBD, Diebold is now Diebold Nixdof , it still trades under DBD, has negative earnings. The last dividend DBD paid was February of 2018. Finally WDR, Waddell and Reed, has suffered mightily due to the competition from low cost wealth managers. Their mutual funds just do not cut it anymore. 10 stocks out of the 100 symbols picked over time is a pretty good track record. We don't yet know what will happen to the 2017 and 2018 portfolios over time. Hopefully, I learned how to pick better than earlier and these stocks will do even better than 90/10. Over all, these portfolios all are doing pretty well. Again, 2014 is a relative laggard. Duration of time is important with the early portfolios 2011 and 2012 doing better than the others. That could be that the market was low when I started publishing my picks. You can click to go to the portfolios tab to see the holdings of each portfolio. http://www.themoneymadam.com/p/blog-page_11.html The table below is a summary of these portfolios. If you were building up to retirement and invested regularly over time, you would probably reinvest the dividend and you might have been tempted to sell some of the dividend losers as I did. For the sake of ease of reporting. These portfolios are long only with no active management. Over time, I added a review of revenues to my stock picking screen. I thought that perhaps if I paid a little more attention to revenue growth, I would have a better chance of avoiding the stocks with shaky dividends. I took a look back at these ten stock and see their revenue trends are revealing. The final table shows the change in revenue over the past three years. Provided that a stock meets all the other criteria for a quality dividend stocks, this metric will determine what to do with the stock. In reality, what did I do: what should we do? In summary, I have one buy, and one hold, and the rest avoid. In my personal portfolio I can move in and out of stocks. Listed below are the actions I took with these losers as well as my current recommendation. I sold COP but bought it back and continue to sell calls against my position. I like the revenue growth and I like the return of dividend growth. But, because the yield is so low, I don't care if my shares are assigned to a call buyer. I can find someplace else to put the money. I call this a Buy - except for the puny yield, their dividend machine fundamentals are solid. I sold when the merger occurred. Looking at recent revenue growth and a yield of 5.4% makes WMB a hold for sure and with more investigation perhaps a buy. However, E.P.S. is less than the dividend. Sold when dividend was cut. Not worth the effort. Sold when dividend was cut. Only for non qualified money as the tax complications make holding in an IRA not recommended. I suffered through the Potash merger and did not like having my income reduced. I was able to sell calls on all shares and sold through being assigned at a profit. Too much drama for a conservative investor's portfolio. The monthly payout was nice but once they cut the dividend, the weakness of their business was exposed. Stick with larger, solid stocks. Most painful buy here. I chased yield and got hurt. I did sell after cashing their juicy dividend and selling some calls. All in all I am even. They still have a business but their entire structure is a mess. Stay away. My very first investment was in a WDR fund that my collage roommate's dad sold me. They are no longer relevant. Again I chased yield. Sold. In that field, I still like Westwood Holdings which has been hammered but is solid. This is the strangest stock of the group. Diebold is into security and one would think that would have been a foolproof area of business. Through partnerships Diebold is international. I sold this shortly after I bought it because it seemed to have little direction. They no longer pay a dividend, but among these stocks it is only one of three with dividend growth over the past 3 years. My conclusion is I remain comfortable picking stocks using the dividend machine basic criteria. I will stick with larger stocks to provide income from dividends. I will stick with a mix of higher yielding stocks and those with more modest yields but on which covered call income is available. Readers of my blog know I do more active managing of my money. These portfolios are buy and hold so I could measure the results easily and quickly. In my own portfolios, I tend to sell calls on stocks with price momentum and therefore, have some stocks called away. I use those gains to buy other dividend stocks. This works out for me. I hope the analysis of the past 8 years will help you become a better income investor. You can use a disciplined income investing approach and expect 90% of your picks to continue to pay and grow your dividend income.